I wasn't going to upload anything today, but I've just found out it's World Photography Day! Image Notes: This is an image of the Front Range of Colorado that is quickly fading to a historical footnote. 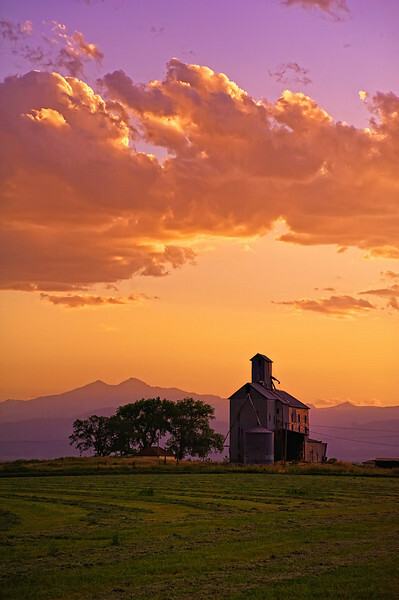 There used to a be a series of farms like this all the way from Greeley to Loveland on Highway 34, and were a view I characterized our landscape by. This is one the the only remaining ones as you get closer to Loveland, so I am attempting to capture these guys before they disappear forever (this one is for sale as industrial lots). For the color effect I went back to an old film days trick: fluorescent correction filter for sunset colors at sunset that trend a bit purple. With the Front Range behind here, I dig the color scheme, hope you all do too.